I will try to keep this as short as I can and in the order that it happened. While I was in my car listening to praise and worship today I had this thought that I needed to apologize to a certain person and in my head I had a brief conversation about what I would say to that person and I quickly shook off those thoughts cause I wasn't about to apologize to this person. I really didn't feel I was wrong. The exact same thing took place 3 different times today. Then during the teleclass (everything that Ameerah was saying)it dawned on me, that was God telling me what I needed to do. And even during the class I was still trying to justify not apologizing to this person thinking if God wanted me to apologize He would have told me to do it during the "How to forgive" class. I reallllly did not want to apologize, I didn't want to admit I was wrong. So after the class my husband asked me if I had a good time in my teleclass. I said "oh yes, absolutely". He looked at me and said "Then why do you look so miserable". This horrible feeling came over me again cause I had to admit out loud that I had to do something I reallllly didn't want to do. And in my mind I was working myself up do making this phone call. My husband (James) said "God told you to do it, don't let satan talk you out of it." So I made the call. When I was done I went back into the livingroom sat down I was fighting tears, my stomach started hurting. I wanted to be mad at myself for doing that. I was literally fighting with my flesh. The conversation with myself went like this - just stop it, you called - get over it. It was the right thing to do, stop crying, God told you to do it- stop acting like this. This went on for about 5 minutes before I prayed and thanked God for the power to stop satan in his tracks and I then rebuked satan and what he was trying to do and immediately my stomach stopped hurting, I didn't feel mad or tense and the tears stopped. Relief and peace replaced those feelings. I could have saved myself a lot of anguish had I immediately rebuked satan instead of trying to reason with my flesh. I prayed by FAITH and not fear. By the way, the person I called accepted my apology, forgave me, and I believe this is the beginning of a better relationship with this person. PRAISE GOD, PRAISE GOD. God bless you Ameerah. 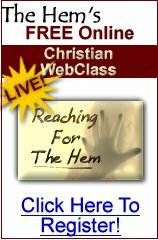 Testimonial From The School of the Spirit's Free Reaching For The Hem Christian Tele-Classes!